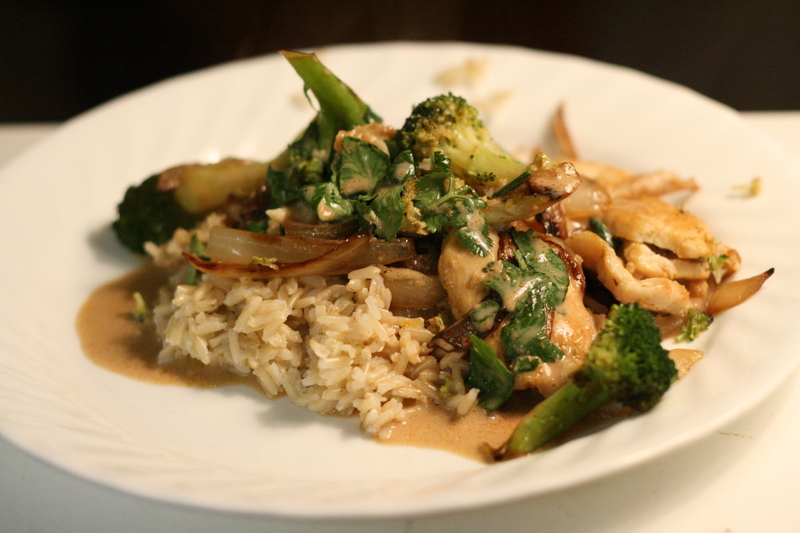 Several years ago I came across an article in Real Simple magazine that gave five different recipes for stir fry sauces. I've used it ever since. The result is that I always have a stir fry that tastes good and there is always variety so we never have to eat the same stir fry again and again. 1. Put rice in the rice cooker -- our family likes brown rice but any kind will do. If you don't have a rice cooker, start cooking rice on the stove. 2. Cut up vegetables -- there are so many combinations to choose from. I always include an onion and often have broccoli and carrots with that. Other ideas are celery, cabbage, bok choy, green pepper, colored peppers, and zucchini or summer squash. Choose the vegetable combination that your family will enjoy. 3. Cut up the meat -- I usually use two boneless, skinless chicken breasts for our family of six. A pound of round steak, or a few boneless pork chops are also nice options. I cut my meat quite thin (1/4-inch or so). I sprinkle salt and freshly ground pepper on my meat. 4. Stir fry the meat. In a large skillet or wok, heat some canola oil (I prefer canola because it is tasteless). Stir fry the meat until done and transfer to a plate, cover with foil and leave until later. 5. Stir fry your vegetables. Add a bit more canola oil to the pan and stir fry the vegetables, adjusting the heat as necessary, or adding more oil, to keep the vegetables from scorching. 6. Make the sauce. While the vegetables are cooking, prepare one of the sauces listed below. (I make about 2-3 recipes of sauce for our family of 6.) Fresh ginger is such an important ingredient in so many Asian recipes. I buy mine, scrub it and then place it in a ziplock bag in the freezer. When I need freshly grated ginger I simple grate it straight from the freezer (skin and all). 7. Combine everything. When your rice is ready, your vegetables cooked, and your sauce finished, add the meat back to the pan along with the vegetables and heat through. 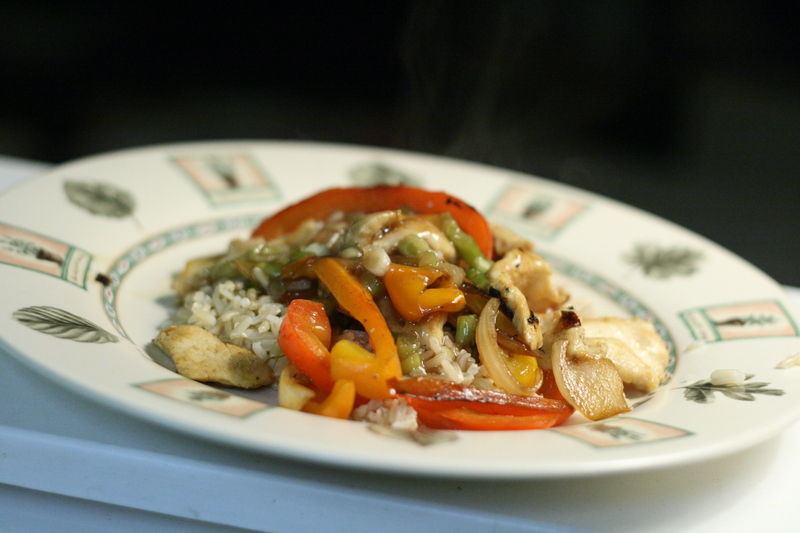 Either plate your rice and stir fry and then top with the sauce, or add the sauce to the stir fry and then serve. In a small bowl, combine broth, soy sauce, sugar, Worcestershire sauce, and cornstarch, stirring until cornstarch dissolves. Place a wok or skillet over medium-high heat. Add olive oil and heat for 30 seconds. Add ginger, garlic and red pepper flakes and stir-fry until fragrant, about 15 seconds. Add the cornstarch mixture and bring to a boil. Cook, stirring constantly to prevent lumps, until the sauce thickens slightly, about 1 1/2 minutes. Pour into a bowl. In a small bowl, combine broth, white wine, soy sauce, sugar, sesame oil, salt and cornstarch, stirring until cornstarch dissolves. Place a wok or skillet over medium-high heat. Add olive oil and heat for 30 seconds. Add green onions and ginger and stir-fry until fragrant, about 15 seconds. Add the cornstarch mixture and bring to a boil. Cook, stirring constantly to prevent lumps, until the sauce thickens slightly, about 1 1/2 minutes. Pour into a bowl. In a small bowl, combine coconut milk, soy sauce, sugar and salt. Place a wok or skillet over medium-high heat. Add olive oil and heat for 30 seconds. Add red pepper flakes, lemon zest, minced garlic and curry powder or paste and stir-fry until fragrant, about 15 seconds. Add the coconut milk mixture and bring to a boil. Cook until the sauce thickens slightly, about 1 1/2 minutes. Add chopped fresh basil. Pour into a bowl. In a small bowl, combine soy sauce, lemon juice, garlic and sugar. Stir until the sugar dissolves. Add fresh basil and cilantro. In a small bowl, combine Hoisin sauce, water, soy sauce and sugar. Place a wok or skillet over medium-high heat. Add olive oil and heat for 30 seconds. Add green onions, garlic, and red pepper flakes and cook until fragrant, about 15 seconds. Add the Hoisin mixture and bring to a boil. Cook, stirring occasionally, until the sauce thickens slightly, about 1 1/2 minutes. Pour into a bowl. I love stir fry! This gives me some great new ideas to try. I don't like rice, but if I could replace it with that rice shaped pasta, I think it would taste really good. Mmm, stir fries, those delicious, throw-everything-in dinners that you go to when you can't think of anything else to cook!! Well, that's how it is in our house!! :-) Of course, they can be attend just about anything; an elegant dinner party, a super quick lunch, a family dinner, etc. We love to add whatever we have on-hand and often have vegetarian stir fries to use up veggies and ply our bodies with all those delish vitamins and minerals! !